Maintaining your vehicles cooling system is critical even in this moderate Bay Area climate. Your vehicles cooling system is just as important as engine oil, ignoring a low coolant light or any warning indicator can lead to serious long term or even immediate engine damage. Don't let a small leak turn into a big problem by leaving you stranded or even a costly repair that was preventable. It is critical to use high quality components and the proper vehicle specific coolant. Using the incorrect coolant will contaminate the system leading to long term issues like pitting, cavitation, corrosion, plugged heater cores and reduced cooling system efficiency. 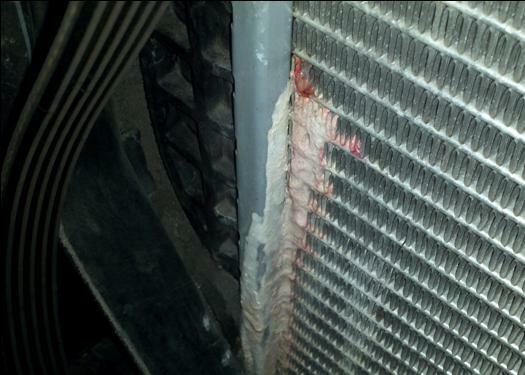 Below is a customer's radiator that has started to leak. 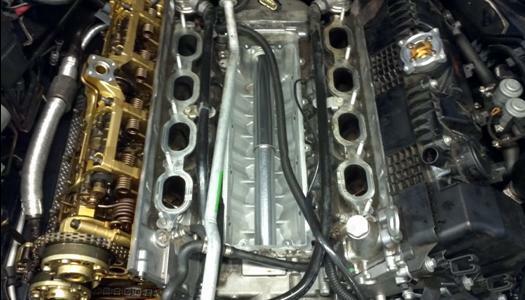 Don't allow a small problem like this lead to larger issues like over heating or even worse a blown head gasket. Don't let a leaking water pump or cracked reservoir leave you stranded. If your seeing, smelling or having to top off your coolant give us a call to have a cooling system inspection performed. It's extremely critical to maintain engine operating temperature at all times. Thermostats are some of the most common cooling system failures that affect engine operating temperatures. It can stick open causing the engine to take an extremely long time to warm up, or, never reaching operating temperature. It can stick close and can cause the engine to overheat, creating dangerous situations in which internal engine damage can occur.